Video Assistant Referee (VAR) technology has been calling difficult decisions in U.S. sports for years, but now the global game of soccer is finally set to fully integrate the system with its first use at a World Cup. The International Football Association Board (IFAB) on Monday, January 22 gave the technology the nod for Russia 2018 following extensive testing over the last two years, paving the way for a final seal of approval at a vote at IFAB’s annual general meeting in March. As with American sports, VAR gives a booth-based official the chance to view video showing what’s just happened on the field, but from a variety of different angles. This allows the official to quickly review a play and communicate with the referee to help with important, sometimes game-changing decisions. England’s goal that wasn’t a goal. Four types of decision can be looked at by VAR, namely goals (and any incidents shortly before), penalties, red cards, and cases of potential mistaken identity regarding the giving of red and yellow cards. A review can be instigated either by the on-field referee requesting it, or by the VAR official if they feel a clear error has been made. 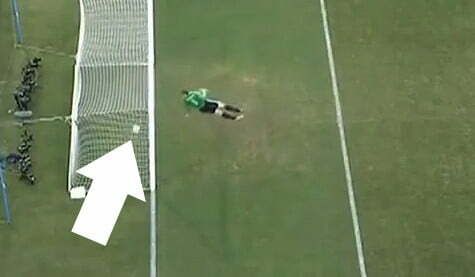 Goal-line technology was used for the first time at the 2014 World Cup, four years after a famous incident where a referee failed to spot a clear goal by England’s Frank Lampard in a knockout game against Germany, which the Germans went on to win. Different technologies exist for goal-line review though most use multiple high-speed cameras and computer algorithms that quickly detect the ball’s location, sending an alert to the referee’s watch when the ball crosses the line. Some argue that VAR causes too many interruptions, disrupting the flow of the game. But disruptions already take place as angry players crowd around a referee following a controversial decision. VAR should serve to eliminate such scenes and get the game moving again once the indisputable decision has been made with the aid of technology. And the fact is, the referee will continue to make the majority of decisions on the field of play, turning to VAR only very occasionally during a game.